Dr Julien Payen investigates emerging nanofibre technology and its potential applications for protective workwear. Personal Protective Equipment (PPE) has come a long way from its early roots, and its evolution is not over yet. As companies across all industries strive for increased worker safety, new technologies are being sought to improve not only the performance of PPE, but also its comfort. After all, if a worker is able to move more easily in their protective suit then they may be able to avoid a hazard entirely. The 1998 Sarin Gas attack in Tokyo, followed by the terrorist attacks on the USA in 2001 and London in 2005 demonstrated that, in addition to its industrial users, the advancement in PPE technology is also of vital importance to meet the changing needs of the first responders - Police, Fire and Medical services - who are at the forefront of tackling chemical, biological, radiological and nuclear (CBRN) threats. 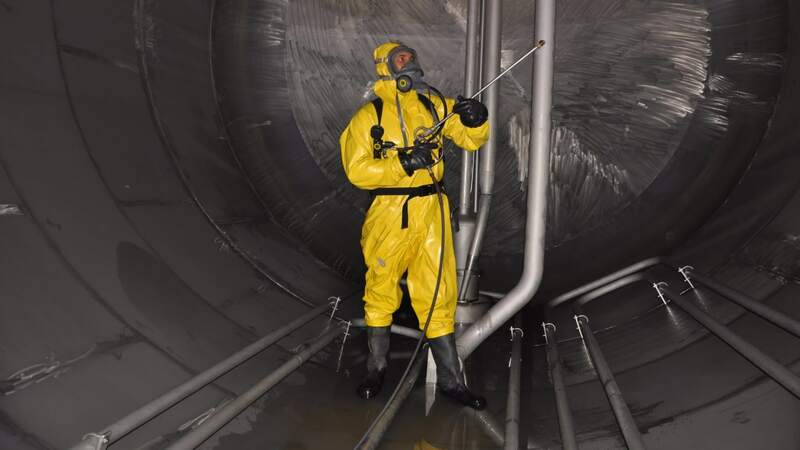 Until recently, first responders and industrial users alike required relatively high levels of protection for short periods only, such as against toxic chemical spills. The new occupational threats, however, from accidents in the nuclear industry and potential terrorist activities, mean that all workers in the line of fire would benefit from more advanced protection. While providing excellent protection for wearers, the existing products create physiological burdens that limit the ability of the wearers to perform their roles for extended periods. In extreme conditions traditional PPE can even threaten workers’ health and safety. Comparable issues are associated with protective face masks, such as those worn in the recent avian flu epidemic in Asia, which offer limited long term operational use and poor long term protection against bio-particles such as viruses and bacteria. FFP2 or P2 disposable masks are the principle products used in a pandemic crisis. Nanofibre particulate filters are made of nonwoven structures based on fibres from microscale to nanoscale. Spunmelt electret nonwovens (formed in the association of spunbond and meltblown processes with electrostatic field) are commonly employed for such filters, as they offer good filtration efficiency with low energy losses. The meltblown process gives very fine fibres, from 500 nm to 8 µm, but with lognormal fibre diameter distribution (Bresee et al, 2006). This leads to a completely heterogeneous structure with poor mechanical properties. To overcome this drawback, association in multilayers with a protective web such as spunbond is preferred, to give what is called a spunmelt structure. "Hydroentanglement is a common non-woven web bonding technique, which uses high pressure water jets to entangle the fibres"
The purpose of this paper is to demonstrate the interest of the carding/hydroentanglement process and electrospinning process (see right) for the formation of submicron fibres, to propose alternative solutions to conventional spunmelt products. The association of carding, or drylaid, and hydroentanglement processes have only recently been used in the area of air filtration. Carding is not, however, adapted to directly process extra fine fibres, and so in order to obtain microfibres finer than 10 µm, special bicomponent fibres are used. Examples of these special fibres are bicomponent pie wedge (PW) fibres, hollow pie wedge (HPW) fibres and islands in the sea (IS) fibres. In our case, the fibres are composed of 16 alternate segments of two different polymers: nylon (PA6) and polyester (PET) for pie wedge, and polyethylene (PE) and polypropylene (PP) for hollow pie wedge (Figure 1). The starting diameter of these fibres is approximately 25 µm, and after splitting into much smaller segments, fibres in the range of 3 to 10 µm are obtained in the final nonwoven structure (Dugan, 1999; Hagewood, 1999; Hedge et al, 2004). Hydroentanglement is a common non-woven web bonding technique, which uses high pressure water jets to entangle the fibres and give the non-woven its strength, compacity and softness. The special use of this technique here also permits the splitting of the bicomponent fibres (Dugan, 2002; Watzl, 2003). The efficiency with which the web is entangled depends on the specific properties of the laminar high speed water jets used. The characteristics of these water jets strongly depend on the operating pressure, nozzle geometry, impact force, production speed, water quality, fibre types, and web structures (Anantharamaiah et al, 2006; Ndaro et al, 2007; Zheng et al, 2003; Mao et al, 2006). The production rate in industry can be in the range of 200 to 400 m/min, for a working width of up to three metres. The second technique investigated is the electrospinning process, which can be used to produce fibres in the submicronic range. The nanoweb produced is usually deposited on a substrate; for example, a spunbond nonwoven web that ensures the mechanical strength of the final bilayer structure. This process is commonly described in the research of Huang et al, 2003. Basically, three components are necessary: a high voltage supply, a capillary tube with a pipette or needle of a small diameter, and a metal collecting screen. A high voltage is used to create an electrically charged jet of polymer solution out of the pipette. Before reaching the collecting screen, the solution jet evaporates or solidifies and is collected as an interconnected web of small fibres (Deitzel et al, 2001). Electrospinning with more than 50 polymers can be found in the literature. Today in industry, the production rate of the electrospinning process is in the range of 10 to 40 m/min for a product width of 0.5 m (Figure 1). Application fields for such fine fibres can be found in synthetic leather, synthetic velvet, trimming textiles for microfibres and phonic insulation material, synthetic blood vessels, ultrafiltration, and tissue engineering for nanofibres (Watzl, 2008; Barhate et al, 2006). Due to the barrier effect of pore size and the filtration efficiency provided by the specific surface area of nonwovens, there are promising applications for these fine fibres to protective workwear, such as their use in semi-permeable membranes, selectively permeable membranes, new fabric finishes and self-detoxifying treatments, as detailed below. We have produced several samples of nanofibre products and as seen in Figure 2 these appear similar to spider silk. We obtained a final fibre diameter close to 250 nm with a lightweight structure of 1 g/m². We have tested filtration properties of the several samples according to ISO EN 149 and these have shown a 25 percent increase in performance against commercially available microfibre products, such as spunmelt (Figure 2a). Due to the high surface ratio of nanofibres, we obtained a product four times more breathable and with a structure 100 times more lightweight than commercial products. The specific surface area of a nanofibre product is 1,000 times greater than that of a microfibre product, as nanofibre gives exceptional performance for its low weight structure. With reference to the samples taken, we had approximately three microns of fibre diameter in the original samples, compared to around 250 nm for the new samples. This demonstrates the barrier effect created by the nanofibre web. As yet there is no definitive answer in terms of standards or testing methods to evaluate risks associated with nanomaterials. There are no existing standards for the management of these risks; however, scientists, producers and lawmakers in the field of nanotechnologies are collaborating to identify and eliminate potential risks. Production of these nanofibre membranes will ensure excellent barrier protection for wearers and the light weight will ensure increased comfort for users. Detailed right are some of the potential new developments. Semi-permeable membrane ‘hybrid’ fabric composites, combine a breathable nanofibre membrane with a much smaller amount of activated charcoal than used in permeable charcoal suits. These material stems create much lighter and less bulky clothing ensembles with better breathability, resulting in improved heat management properties compared with traditional permeable fabrics. Nanofibres with selectively permeable membranes provide higher levels of protection against aerosol and vapour threats than impermeable fabrics, combined with the cooling effect of permeable materials; for example, they allow water vapour molecules to escape from inside the garment. This is important to prevent workers overheating, while ensuring safety is not compromised. These membranes do not require the use of activated charcoal materials as part of their protection; however, efforts to improve the performance of these membranes by incorporating self-detoxifying elements into the polymer matrices, or other fabric layers used with the membranes, is seen as the next progression for creating the ultimate balance of protection and performance. Improving fabric finishing treatments for nanostructured surfaces reduces liquid and particulate threats by preventing them from adhering to the fabric surface, thereby reducing the risk of penetration and cross-contamination, such as when doffing PPE. There has been much focus on antimicrobial finishes, with Quaternary Amine Compounds (QACs) emerging as one of the most effective treatments in terms of the broad spectrum effect - biocidal, rather than biostatic properties, and speed of action. These range from antimicrobial finishes with limited speed and range of effect, to specific chemically synthesised polymer additives, which act as artificial enzymes to catalyse and neutralise pathogenic threats. A number of leading universities, commercial research institutions and military scientific bodies have developed nanoscale metal oxides for these purposes. These nanomaterials can be incorporated into nanofibres’ matrices. The first market addressed for nanofibre protective workwear concerns CBRN threats and protective workwear for first responders; however, some of the hazardous conditions faced by individuals in the Police, Fire and Medical services are mirrored by those working in industry, where nanofibre technology could significantly impact on safety. In this paper we have shown different ways to ensure production of nonwoven nanofibres that can be used as a membrane layer in protective workwear. Production and utilisation of nanofibres in protective workwear has to be strictly surrounded by regulation and standards to limit health risks. First responders’ protective workwear will be the first market addressed for these products. To be used in these markets, however, nanofibre PPE will have to answer to current standards such as EN 149, EN 14683, EN 374 or BS 5438 and be easily reproducible at an industrial scale.